Lab Supply offers paper-chip bedding from Shepherd Specialty Papers. Laboratory Animal Bedding for contact and non-contact use. PAPERCHIP® is manufactured primarily from used newspapers and is the result of years of extensive lab testing. It is available in two different textures, each available in 35-pound autoclavable paper bags. Regular Texture Pelleted PAPERCHIP– The pelleted texture is dust-free, absorbs moisture, and controls ammonia odors. It is popular for use in both contact and non-contact settings, and is a good choice for your cats and guinea pigs. 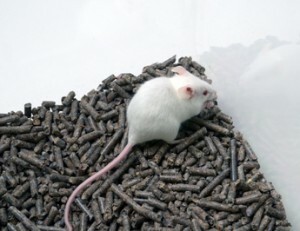 Softer Texture Pelleted PAPERCHIP – The softer texture is a crumbled pellet for use as a contact bedding for small rodents. This soft nesting material absorbs moisture to keep animals dry, and controls ammonia odors. About the Environment: In an ever-shrinking world where even the most remote waters are becoming polluted and mountains of garbage are being created, it is critical that each of us recycle to reduce waste. PAPERCHIP® is an environmentally responsible product. Long-lasting – In controlled laboratory tests, PAPERCHIP® has proved to be significantly longer lasting than common woodchip products. This not only saves on bedding cost, but it also saves labor required to change the bedding. Absorbs Odor – PAPERCHIP® has proved to be significantly better than woodchip products at controlling NH3 production. This results in longer bedding life and a more pleasant laboratory environment. Very Absorbent – PAPERCHIP® will absorb up to 400 percent of its weight in liquids, keeping your animals dry. Environmentally Responsible – PAPERCHIP® can be incinerated with less than 2 percent ash content. It is also completely biodegradable and makes an excellent composting material. Dust-free – In sieve tests, less than 1 percent will fall through a No. 20 sieve. That means a healthy, clean environment for your staff and animals. Easy Cleanup – PAPERCHIP® will not stick or cake to cages or pans, which makes for easy removal. Autoclavable – The 35-pound paper bag is designed so the product can be autoclaved in the bag. PAPERCHIP® retains its consistency and odor-control properties when autoclaved. Please call for pricing or samples.